You'd be hard pressed to argue that the OnePlus 6T and the iPhone XS Max weren't two of the best smartphones of 2018 (and they're both going strong in 2019) – but which is the best of the two? And which should you be picking first for your next mobile upgrade? Here we're going to put the two handsets head to head in all the areas that matter: the design of the phones, the internal specs, the features they bring along with them, the software on board, and more. If you're choosing between them, make an informed choice. How do you like your notch? The iPhone XS Max has a rectangular one very reminiscent of the iPhone X, whereas the OnePlus 6T goes with a smaller teardrop-style variation. In terms of dimensions, there's not much in it: 6.41 inches for the OnePlus 6T and 6.5 inches for the iPhone XS Max. Both phones use OLED screens. Otherwise these are two fantastic-looking phones. They're both glass front and back, though the iPhone XS Max goes with a stainless steel frame, while the OnePlus 6T is rounded with aluminium. You can pick up the OnePlus 6T in what OnePlus calls Thunder Purple as well as two variations of black, while the iPhone XS Max is on sale in space grey, silver or gold. But which one has the best design? That, dear reader, is down to you. What we can say is they're both very appealing aesthetically, and you won't be embarrassed to take these out in front of friends and family. Neither phone has a fingerprint sensor on the rear – it's in the display on the OnePlus 6T, while the iPhone XS Max uses Face ID instead. Comparing specs between phones can be tricky, because manufacturers apply a whole host of tweaks and optimisations on top of the components they've picked, so what you see on paper may not be what you actually get. These are two of the most powerful phones on the market at the moment, though Apple probably just has the edge thanks to that lightning-fast A12 Bionic processor. The OnePlus 6T brings with it the Snapdragon 845 processor, top of the line for Android flagships in 2018, and 6GB or 8GB of RAM. That's coupled with 128GB or 256GB of internal storage. The 6.41-inch display we've already mentioned runs at a resolution of 1080 x 2340 pixels – it's not quite as sharp as the one on the iPhone XS Max, but it's unlikely that your eyes will be able to tell the difference. The 6.5-inch screen on the iPhone XS Max runs at a resolution of 1242 x 2688 pixels. As we've mentioned, you've got the Apple A12 Bionic processor on board, and that's coupled with 4GB of RAM. Your internal storage options are 64GB, 256GB and 512GB, so you can get more storage than you can on the OnePlus 6T. Neither phone has a memory card slot. Let's talk about cameras: the OnePlus 6T has a dual-lens 16MP+20MP rear-facing camera, whereas the iPhone XS Max has a dual-lens 12MP+12MP camera on the back. While OnePlus wins in terms of megapixels, the general consensus seems to be that the iPhone takes better photos more consistently – though both cameras are very good in a variety of scenarios, including low lighting. The iPhone XS Max offers wireless charging and full IP68 waterproofing, neither of which the OnePlus 6T can offer, so two more points to Apple there. Neither phone has a headphone jack – the OnePlus 6T uses the now ubiquitous USB-C for its sole connection port, while the iPhone XS Max uses the Lightning connector that Apple favours. Perhaps most importantly, the OnePlus 6T runs the latest version of Android (with some OnePlus tweaks on top) whereas the iPhone XS Max runs the latest version of iOS from Apple. It's the differences between Android and iOS in terms of customisation, slickness and privacy that may well be the real dealbreakers here. If you've got used to one way of working, you might not want to swap. Considering these phones both look great and bring with them a lot of power, it may well be that point that we just mentioned that helps you choose between them – Android vs iOS. If you're used to iPhones, or you've got a lot of Apple kit at home already, then it makes sense to go with an iPhone for your choice of handset. For everyone else, Android has a lot going for it too. We haven't mentioned price yet: check the widgets on this page for the latest deals, but you're going to be spending a lot more to get your hands on an iPhone XS Max than you are to pick up a OnePlus 6T. That might make the OnePlus 6T better value for you, even if you don't get all the bells and whistles like full waterproofing and wireless charging. Really though, there's not much to choose between these two stand-out phones of 2018, and they're both going to last you a lot of years if you look after them. 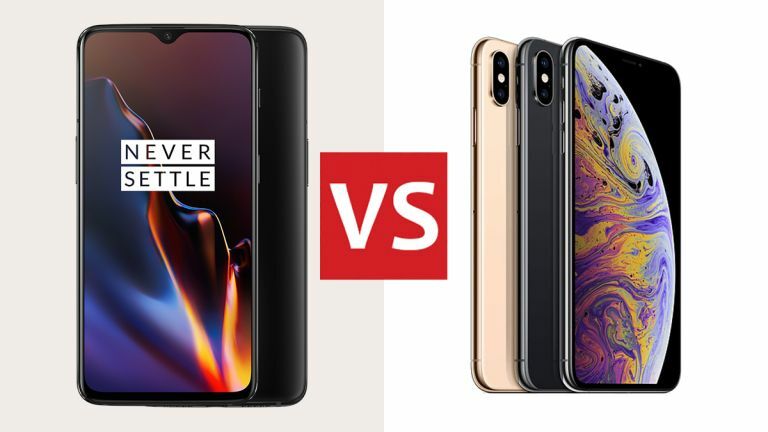 We'd be happy to use either as our handset of choice, so you can't really go wrong no matter which one you pick... just make sure you know whether Android or iOS is going to suit you better.